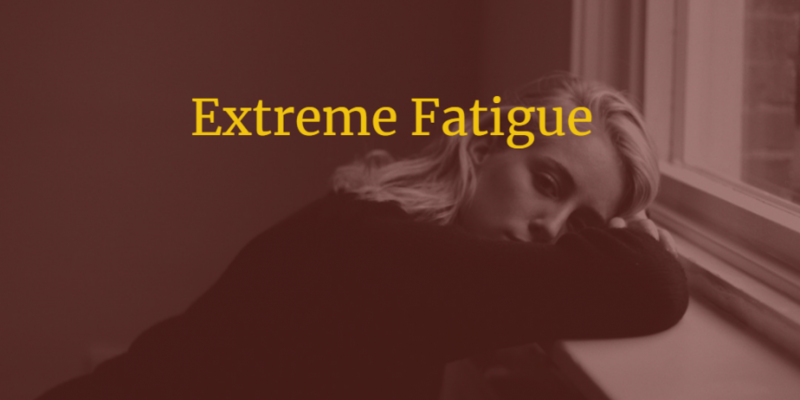 Over the last few years, I’ve experienced extreme fatigue. It’s the kind of tired that causes me to lay down in the middle of whatever I’m doing and practically pass out. It doesn’t matter how much I want to finish what I’m doing. It doesn’t matter where I’m at or if I’m sitting or driving or at work. It wipes me out! It also seems to coincide with my monthly cycle. So, knowing I have PMDD I figured It was associated with that, and it might well be. But, I also know it could easily be related to perimenopause. Here’s what I discovered. Fatigue is a health concern in which you can become so tired that you find it difficult to get out of bed – much less get through your daily activities. When you hit this level of tiredness, something is going on inside your body that robs it of the ability to function normally. What you need to be aware of is that fatigue itself is not a diagnosis. It’s a symptom that you have a medical situation going on that needs to be examined. There are several different causes of fatigue. One cause is when you simply push yourself beyond your body’s capabilities. But for most people, fatigue isn’t caused by something they can point to and say that it happened because they overdid it. 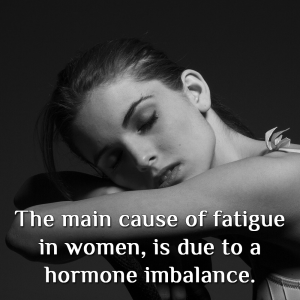 The main cause of fatigue, especially in women, is due to a hormonal imbalance. It can take awhile for your hormones to get out of whack – and because it happens so slowly, many women don’t notice it until the fatigue sets in. When hormones get too high or too low, it impacts every aspect of your health. One of the causes of fatigue in women is when estrogen and progesterone levels aren’t where they should be. When these levels are off, you’ll notice that you begin to drag and you may also notice that you’re suddenly not sleeping well – even though you feel bone tired. As a woman goes through specific stages in life, there’s a greater chance for a hormonal imbalance to kick in. When a young woman hits puberty, her hormones can suddenly change and this can lead to that imbalance, followed by fatigue. During monthly menstrual cycles, the levels of estrogen can drop low and lead to fatigue. When a woman is pregnant, this can also cause a hormone imbalance. So can the time immediately following childbirth. For women who are older, it’s perimenopause and menopause that can be behind the fatigue. One of the reasons for a hormonal imbalance during these times in a woman’s life is when the estrogen level isn’t right. Estrogen is what impacts cortisol and cortisol is what’s in charge of the body’s ability to deal with stress. When the estrogen level isn’t right, the cortisol can’t do its job, which in turn leads to great imbalance and fatigue. When the estrogen is off, the progesterone can be out of whack as well. One hormone, estrogen, can sometimes be higher in production during a hormonal imbalance. This can lead to cortisol changes, which cycles right back to fatigue again. If you have a hormone imbalance in your thyroid, this can lead to a reduced level of the hormone that’s needed for energy. Because the thyroid isn’t making enough, which is called hypothyroidism, this can lead to fatigue. Women experiencing fatigue should have an endocrine workup done by their doctor to test their hormone levels. You might find that tracking your symptoms before visiting the doctor can help you explain and show what you’ve been experiencing. 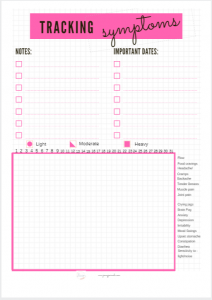 Check out the printable tracker I created for you below! 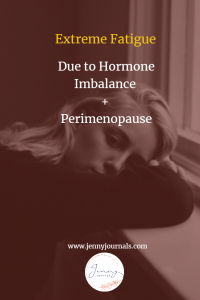 Previous Post Am I Having Perimenopause Symptoms?